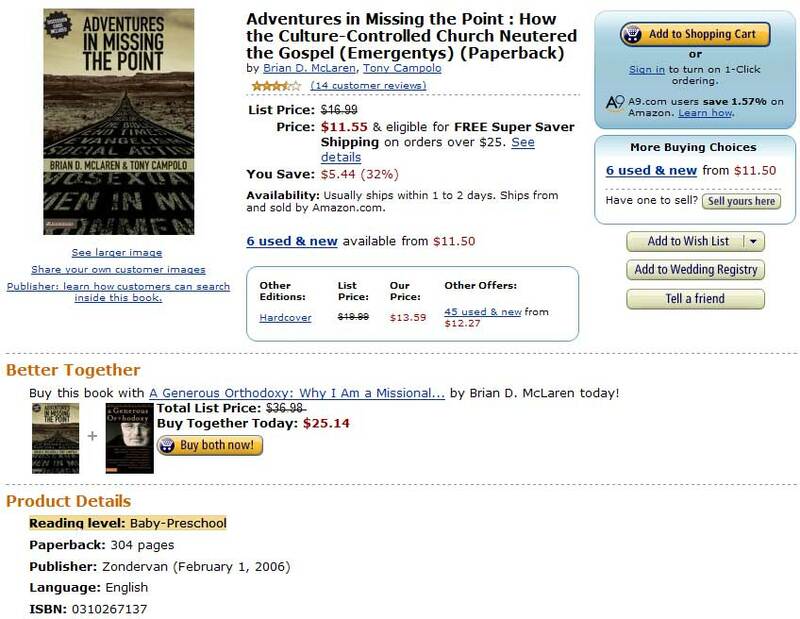 According to Amazon, “Adventures in Missing the Point: How the Culture-Controlled Church Neutered the Gospel” is at the “Baby-Preschool” reading level. Apparently Emergent theology is so watered down even your 2 year old can grasp it! Barring breaking news, natural disasters, acts of God, etc. Bluer will be featured in a segment about emerging churches on ABC Nightline tonight at 10:35 CT (11:35 ET). Look ma, I’m on the TV! Bluer, the small community of faith I belong to, is going to be featured on ABC Nightline news. Yeah. It takes a while to sink in. I’ve been told I cannot, under any circumstances, wear my monkey shirt. Which is cool, because I vowed to never wear it to church after the first time – it was so distracting some people completely missed the scripture I was reading… and that’s just not cool. …please pray that somehow the Kingdom is served by this. 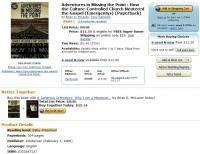 I met Aaron Flores when I was in Lynchburg presenting at the Internet Evangelism conference. He’s a sharp young guy that has somewhat of a ministry to vloggers (via his vlog) and pastors a church in California. His graduate research was a study on the emerging church. He has some additional notes on his post. As churches in the United States navigate the culture of the 21st Century they are increasingly inquisitive of their own identity in a postmodern context. Through what is known as the â€œemerging church,â€� the significance of existing as a new kind of church in a postmodern reality has surfaced. This study focused on an exploration of the features of the emerging church in the United States, particularly its values, characteristics, and mindset, and in order to develop a comprehension of its missiological intent in relation to culture, the related literature concentrated on comprehending the following concerns: Is there a definition for the emerging church; are there similarities and contrasts regarding the values, characteristics, and mindset in the emerging church; how does the emerging church express its ecclesial identity and missiological intent in relation to culture; and what are the conclusions and implications for the future? The research methodology sought to comprehend how the emerging church in the United States exemplified values, mission, and descriptives. TONY JONES (National Coordinator, Emergent): Is it more sloppy than what a systematic theology professor does, sitting in his tenured chair typing up a book on the doctrine of the atonement? Yeah, it’s messier than that! But that’s, I think, theology as it works itself out in the lives of human beings who are kind of scratching and clawing their way to try to follow Jesus on a daily basis. It’s a messy endeavor, and I embrace that messiness. You are currently browsing the archives for the Emerging Church category.